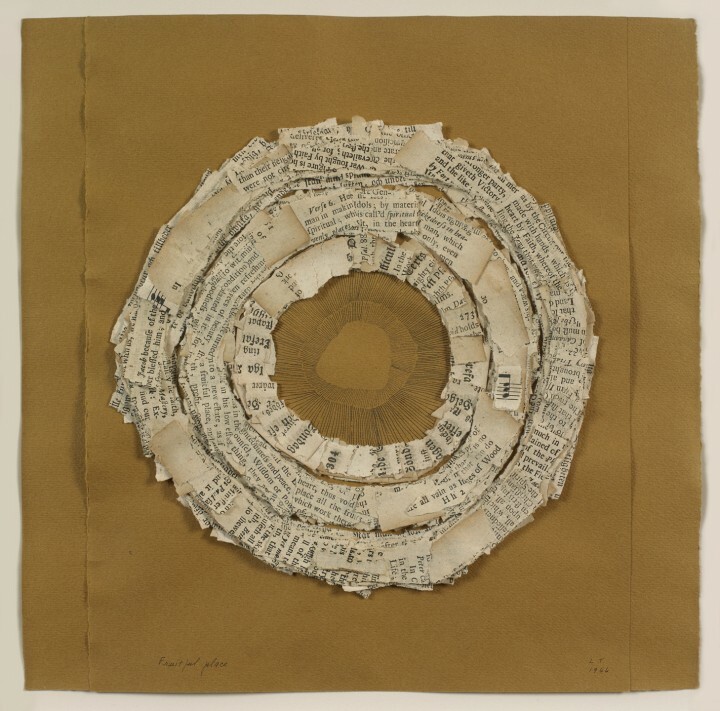 Lenore Tawney’s Fruitful Place (1966) has a delicate tactility, built up in layer upon layer of torn and cut paper, and augmented by the close, careful hatching of the artist’s pen strokes at its center. Concentric paper rings recede into and project from an imagined perspectival depth until the woven form of a basket eventually begins to suggest itself. This shape is offered to the viewer as a receptacle in which to “place all the fruits,” as dictated by a line of visible text. Torn from an assortment of antique hymnals, the included fragments are poetic puzzle pieces of a spiritual message, given new physical consequence through Tawney’s simple, but deft, manipulation of medium. Among certain circles, Tawney is lauded as a pioneer of the resurgent fiber arts movement of the mid twentieth century. Creating narrative lines with weft thread or crafting monumental hanging tapestries of totemic presence, she blurred the boundaries between weaving, sculpture, and drawing. While best known as a weaver, Tawney was equally prolific in drawing, collage, and assemblage. She produced a persistently innovative body of work over the course of a five-decade career as an artist while returning to a coherent set of inspirational sources, many of which are brought to bear in Fruitful Place. Tawney’s collages and assemblages are reliquaries of natural and man-made ephemera, from shells and feathers, to found boxes and manuscripts. These works especially are often equated with ritualistic offerings, described in terms of visual poetry, or endowed with sacred connotations. It is helpful to consider her work as the expression of a dynamic process. In her weavings, Tawney choreographed thread in order to conduct three-dimensional space in the same way that musical notes form a composition; she saw woven threads “like music moving in air.”1 Consistently driven by the desire to make things reach “out and up,”2 she uses strips of paper here much as she used thread. When considered in this light, Tawney’s activity of cyclically pasting the strips of torn hymnal acquires a rhythmic tone. 1. Quoted in Vestures of Water: The Work of Lenore Tawney (Allentown, PA: Allentown Art Museum, 1997), 2. 2. Quoted in Lenore Tawney: A Personal World (Brookfield, CT: Brookfield Craft Center, 1978), 11. Lenore Tawney (b. 1907, Lorain, OH; d. 2007, New York) was a student at the Institute of Design, Chicago (1946-1947). She studied tapestry at the Penland School of Crafts, North Carolina (1954) and then joined a community of artists working in Coenties Slip in Lower Manhattan. She studied gauze weaving with Lili Blumenau in New York (1961). During the mid-1960s, Tawney began to work in drawing, collage, and assemblage, a practice she continued throughout her life. She was an artist-in-residence at the University of Notre Dame, Indiana (1978), and at the Fabric Workshop, Philadelphia (1982). Tawney was a guest lecturer for Visual Arts and Fiber at The Banff Center, Alberta, Canada (1983), and a distinguished lecturer at the University of Arizona, Tucson (1987). She has received awards from the American Craft Council, the James Renwick Alliance, and the American Craft Museum, in addition to an honorary degree from the Maryland Institute College of Art, Baltimore. Her first major retrospective was held at the Museum of Arts and Design, New York (1990). Recent solo exhibitions were held at the Maryland Institute College of Art, Baltimore (2012-2013) and the University of the Arts, Philadelphia (2013). Her work is housed in the public collections of The Museum of Modern Art, New York; The Metropolitan Museum of Art, New York; The Art Institute of Chicago; and the Cooper-Hewitt National Design Museum, New York. Quoted in Vestures of Water: The Work of Lenore Tawney (Allentown, PA: Allentown Art Museum, 1997), 2. Quoted in Lenore Tawney: A Personal World (Brookfield, CT: Brookfield Craft Center, 1978), 11.